Well, I'm doing my duty. Converted another iUser to the world of Android and she's lovin' it. Now her only problem is she needs some cables. Which got me doing some searching. Right now, my go-to cables are the ones from Nomad. I flippin' love the universal USB-C, and that sits in my laptop bag. Great for the charger for my Pixelbook, or great for when I have a regular USB wall adapter. Then I got the Nomad Charging Hub. Great hub charger sitting here on my desk, but USB-C to C cables are a little harder to find, and using the regular USB-A to C cable is fine for my Pixel, but still only charges at 'normal' rates. I want something C-C to be able to tap in to the quick charging. 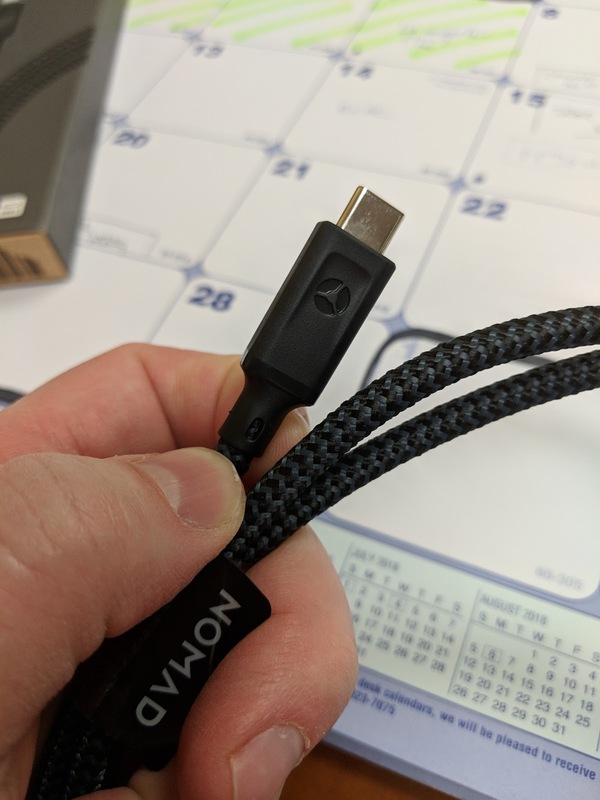 Well, just announced today (and I was able to play with for the past while) is the new 100W USB-C to USB-C cable from Nomad. At $40USD it's a little pricey, but there's a reason. And it's that reason it's now my cable that I trust for my phone. 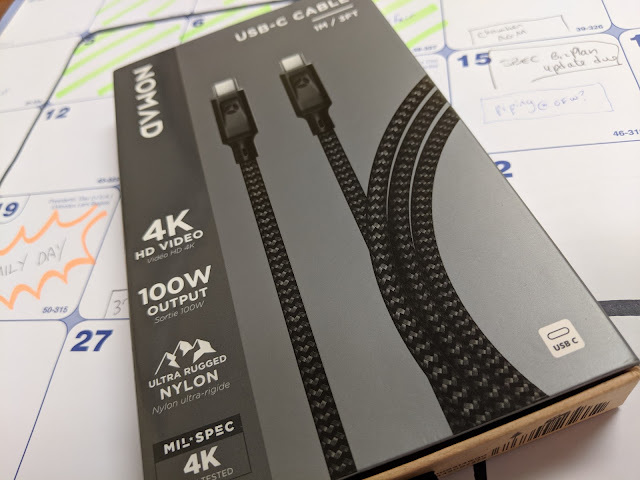 First up, the cable is thicker than their other USB-C cables. When this is meant to be delivering 100W of power it's got to have some 'guts' to it. The other model they have ($24USD) is just 60W, which has been fine already for me. So, it's thicker, can deliver more 'punch' at 100W output, which this is meant to be delivering 4K video output from say the Macbook or receiving USB-PowerDelivery charging speeds. It was cool to see my phone say "charging rapidly" when I plugged it into the hub port. The hub never said it delivered PD level, just 'fast charging'. Most chargers when they say fast charging they don't mean PD. But maybe they just need this awesome cable to be able to handle it properly. The other change over the other cable is that it's only 4K mil-spec tested (meaning they bend it to 150° 4,000 times), whereas the others are 10K... but really, are you going to know the difference. 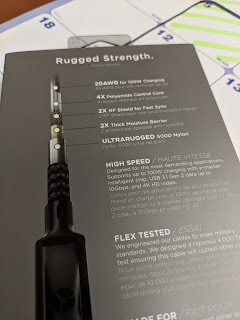 The heavy sleeve and good base connector give you a lot of confidence that this won't have any issues with your device or if your 10 year old kid gets it to plug his device in and just bends it while watching crappy Youtube videos (I can't tell you how many cables he goes through). It feels wrong to relegate it to my desktop cable for my phone while I'm at the office, but really pushes out the full wattage to get my charging quickly.